If a picture paints a thousand words, this commentary will be short and concise. To a certain degree, this is a reprise of comments made last August, when I looked at whether an investment in bonds or stocks made sense at that time. Fast forward to today, and the markets are developing a similar trend to those that were in full bloom by mid-August. Investors have recovered from the downgrade of US debt, wrangling over the increase in the debt ceiling and various problems in Europe to push stocks higher from those lows. However today the “financial cliff” is being discussed along with a Greece exit from the euro and a still weak recovery are in the forefront of investor worries. So now what? The performance relationship between stocks and bonds has been in a relatively narrow band over the past three years, alternating between short periods of stocks doing well vs. bonds and vice versa. The ultimate move higher (bonds performing better than stocks) has been relatively short – a 4-6 weeks period once stocks begin to falter. Of course it also follows the mantra of sell in May and go away as well, but I’m putting that down to coincidence. IF the past repeats again, bonds relative performance should be better over the next couple of months before stocks once again assert their dominance. 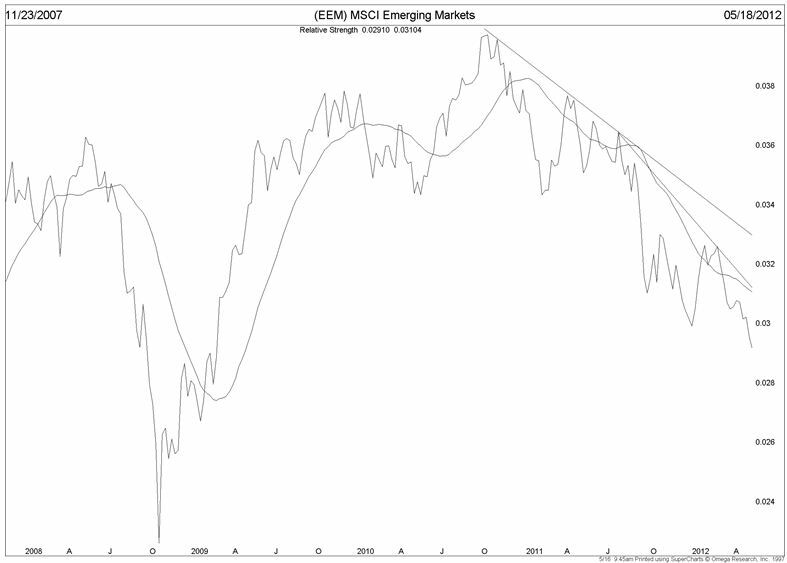 The above is the relationship of EEM to the SP500. A falling line indicates the SP500 is performing better than EEM. 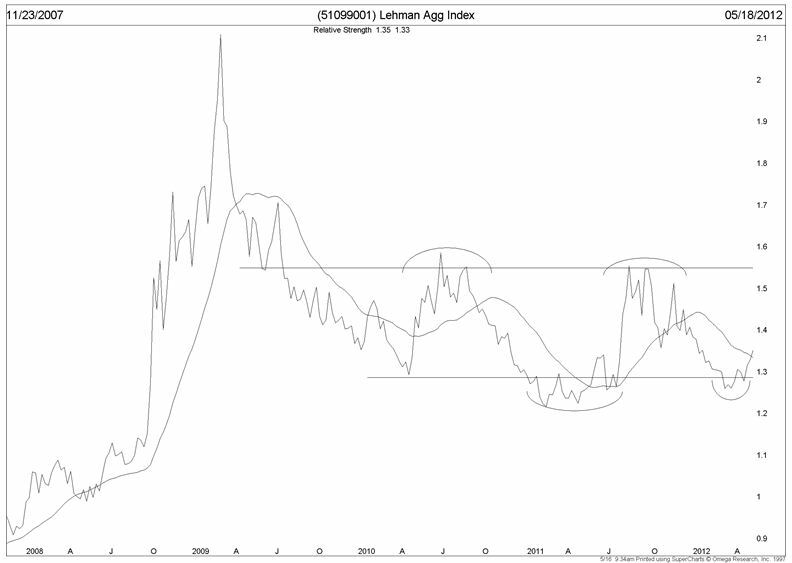 What started as a downtrend early in 2011 has become a rapidly deteriorating situation over the past nine months. The decision between sending your money overseas, either in emerging markets or even in the EAFE (not shown – even worse!) or keeping it at home has been a rather easy one for more than a year – keep it at home. Here at home, the Fed has been bobbing and weaving, twisting and shouting when it comes to monetary policy. The various quantitative easing policies and the most recent “operation twist” have put investors on inflation alert, worried that inflation can only explode with the printing presses running full tilt. So maybe an investment in commodities would be profitable as compared to investing in stocks. An investment in commodities in mid-2009 would have fared just as well as an equal investment in the SP500. The spike last summer was a combination of higher energy and gold prices, both of which have come down rather dramatically since then. The horizontal might be level of support, which means that from here on, commodities would be performing better than stocks. That is merely a guess; however I would like to see more of a bounce in the coming weeks before committing money. So when investors are looking around for places to invest, keeping money close to home makes the most sense right now. A long-term bias toward high quality large cap stocks should be a good port in any storm, but a short-term bias toward bonds may be warranted. The equity markets are sorting out growth concerns in the US, the deficit and the election process keeping the daily volatility high and scaring investors. Following the money (and the charts) means keeping money in defensive parts of the markets and overall risk levels low for the time being. It just may be another uncomfortably hot summer!